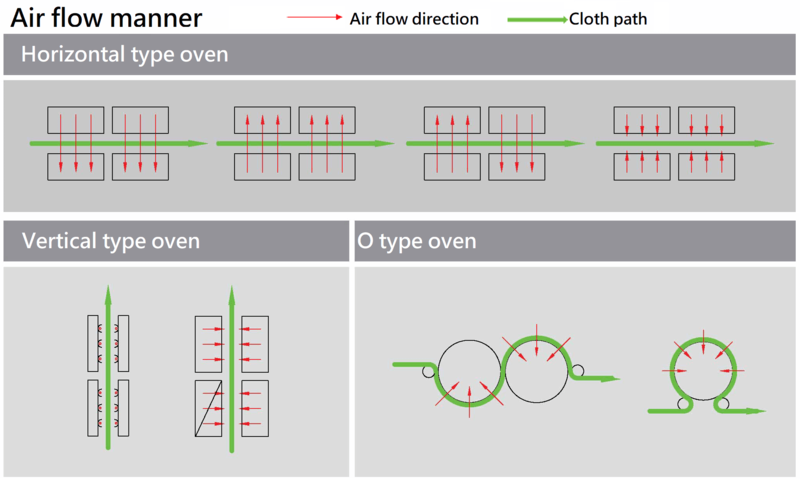 According to the drying, melting reaction, delivery type, and air flow manner of the processing fabric to decide the oven design. When the processing fabric is moist, need to remove the moisture via heat circulation flow. During this process, the humidity of the air in oven will increase. This air with high humidity need to be expelled from the oven appropriately to achieve the purpose of drying. Chemical bonding, gluing, and sizing process all need this drying process to strength up the fabric. The processing fabric contains low melting-point composite fiber, after heating up to the melting-point by heat circulation air flowing through the fabric to melt dispersed fibers to form the fabrics. This process is by way of controlling hot air temperature, air volume, and reaction time to achieve the required physical characteristics.